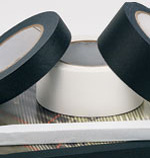 Riverside has 11 different colors of Low Gloss Finish Cloth Gaffers Tapes & Bookbinding Tapes to choose from. Also available are 7 different colors in a matte finish. Gaffers Tapes are also available in Fluorescent Colors. Choose what you need in sizes ranging from 1/2" to 12" in width. When ordering, please be sure to order a color by clicking on the size you want and then look at the colors available on the drop down menu.